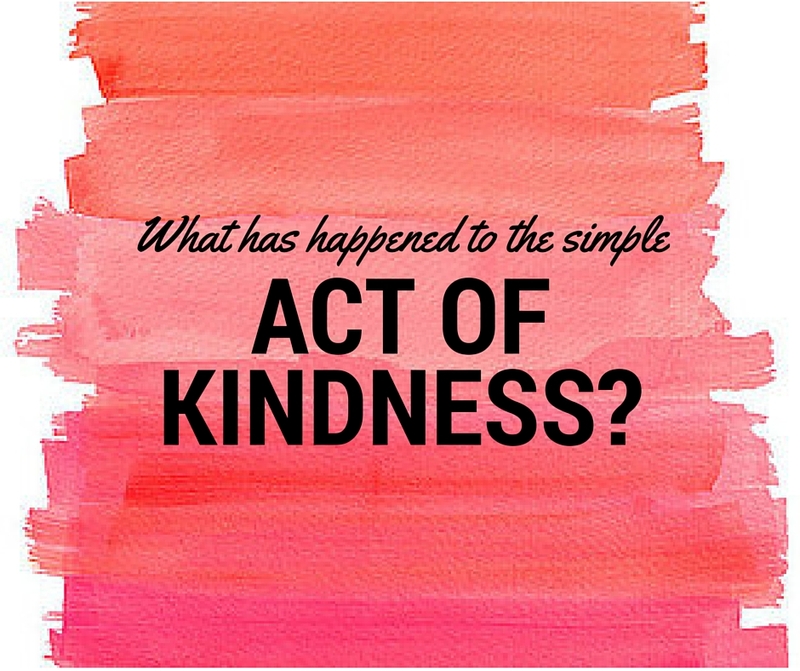 What has happened to the simple act of kindness? I was out walking the other day with my 70kg worth of dogs, pram and child, when a woman stopped her car, wound down her window and spoke to me. She told me that she has seen me out walking and admires how I make it look so easy (she obviously hasn’t seen me try to rein in the beasts when they see a cat across the road) and how I’ve inspired her to get out more with her dogs and kids. Like letting someone in front of you in the traffic. Or when someone lets you in to the queue, you wave as a gesture of thanks. These days it’s more likely that if you don’t let someone in to the queue, they honk their horn and flip you the bird. Or when you do let them in, they’re so busy then trying to duck and weave to the front of the line, they completely ignore you and cut off other drivers. The small acts of kindness don’t have to cost anything, or even disrupt your day. I’m not talking about giving a total stranger a kidney, although that would be amazing. Just something small. Like if you see a mum struggling to wrangle her kids and unload her groceries on the conveyor belt at the shops, offer to help unload her trolley. Someone did this once for me and I was completely shocked by the act. But so grateful. I didn’t want to ask anyone for help. I should be able to be Supermum and do it all myself. But sometimes if someone were to offer to help, it would be fantastic. That act of kindness would be greatly appreciated. Now I don’t think by any means, that this post will cause some global movement into reintroducing random small acts of kindness. But maybe it might inspire you to think about what small, simple things you could do to make someone else’s day brighter or easier? I’d love to hear of the small things someone has done for you to brighter or make your day easier. < Previous What is worse than finding a spider in the bath tub? Greetings Emma – I agree with you. It takes only a moment to do or say something kind to someone. About a month ago, a man in a wheelchair (missing one leg) was wheeling himself to the front door of the coffee house. A woman was holding the door open for her healthy 10-yr old son, but let the door close as the man in the wheelchair approached. It made me furious! Nevermind that the man was in his 70’s and was proudly wearing his Vietnam militay cap…the man was in a wheelchair!!! How the heck do open the door for your very capable son, yet allow it to slam shut for someone who is disabled?? I got up from my chair and coffee, I proudly held the door open for the gentleman, and sorry to say….I had a few harsh words for the mother. Yes I love the ‘random acts of kindness’ stuff and love to do what I can when I can for other people. Also love it when they do the same for me. Can’t think of any examples right this second, sorry! I have written about this myself a few times. People are so caught up in their own lives, it is very sad. I went for a run on a very popular circuit last week. I smiled at every person who went past, and there were quite a few on the popular 7km circuit and not ONE person smiled back. They either didn’t look at me at all or looked and then looked away. What has happened to people?! You are so true! I strive to make an effort to make small acts of kindness in the everyday, but I, like most people could be much better at it. Because the little things that does not cost you more than one minute might mean a lot to someone else. Very glad to have found your blog at Suzi81’s blog party. What a great proposal. I’ll join the movement here from Norway! I checked out your blog from Susie’s blogging party. I love the soft touch of your kindness post (and I love the name of your blog). Just on Friday I read a review of a gardening book on a blog, and I immediately ordered it for my sister. It is not a special occasion just a gesture to appreciate all she does for me. But the acts of kindness don’t need to cost money; that just happens to be the one that came to mind. Thanks for connecting and glad you enjoyed the post 🙂 I absolutely agree, it does not have to be about costing money, it can be as simple as a smile! Paying it forward is fantastic! It’s something I do attempt to make an effort to do. Though I had far more opportunity as a single twenty something career person than a stay at home mom. Somehow I’ve become the charity case. 😉 hehe. I try everyday, and I think they are so important. We are all in such a hurry, but to hold a door, give a compliment, let someone merge in front of you is only a matter of seconds and it does makes everyone feel better. I love this 🙂 I try and tell female strangers that they look great, or that I love their hair, or I think they are really pretty. I live in a small rural town of about 6800 people. In the last month I’ve had several people allow me to cut in front of the in both traffic and at Walmart. The car in front of me paid for my meal at Burger King and my pharmacy allowed me to get my medicine and pay them out of my next check. These random acts of kindness are fairly common here in the boondocks. My son, however, lives in NYC and that’s a totally different story! Keep your faith in humanity. PS: I found your post on Suzie’s blog from the blog party.